Godstone Stoves - Fireplaces/Stoves based in South Godstone, Surrey. 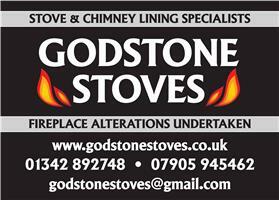 Godstone Stoves are Professional Installers of Wood Burning Stoves, we are a small family run business. We provide a friendly, professional , honest and reliable service at competitive prices, taking pride in completing all works to a high standard, using quality materials, paying close attention to detail & taking utmost care of your home during this process. HETAS approved Engineers with over 30 years combined experience in the fireplace & stove industry. Our Engineers have seen it all in this field of work and know how to overcome issues. We undertake fireplace alterations, fit twin wall insulated flue systems, chimney linings, fit oak beams, fire surrounds, granite/stone hearths. We complete all building works as one in this process. We work to the highest degree of tidiness and workmanship as is possible, seeing is believing. Request a free home survey & quotation to determine size & model of stove required, combined with site inspection to clarify regulations are met before installation. We are here to help you determine your requirements & help you understand how to use your new stove & maximize its potential. All our flue systems come with a full warranty and are installed at competitive prices. We also now offer a combined Annual Sweep and HETAS Stove Inspection service. We are based in Godstone, Surrey and cover Surrey, Sussex and parts of Kent.